Chicago Window Expert Nobody knows more about windows. I am excited about a little-known approach for window or curtainwall retrofit that can create dramatic improvements in building performance at a far lower cost with no down-time, showing energy paybacks in as little as only five years! The solution, sometimes called a commercial interior storm window is to add an interior mounted layer of glazing to your existing window. This sounds simple, but there can be a lot to it. This custom interior window can be packed with features that will benefit your building in all sorts of ways. 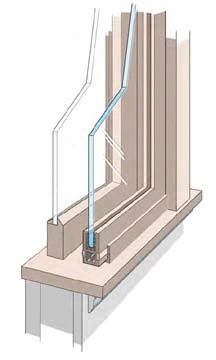 For instance you can add a single glass, low-e glass, or insulated glass for far better thermal performance. You can add spectrally selective low-e coatings to “tune” the way energy enters and leaves through the windows. Between glass blinds work extremely well with supplemental windows because the blinds stay cleaner and receive less wear from handling. You can even use dimmable glass for the ultimate in solar control. The new secondary windows fit tightly, creating dramatic improvements in air infiltration, which in turn reduces street noise. You can add laminated glass to an interior window for safety, UV resistance and sound attenuation. You can even make these commercial interior storm windows blast and hurricane resistant! Government, military and bank buildings can benefit greatly with this added security. When well designed interior mounted secondary windows are added to drafty, too bright, uncomfortable work spaces, occupants report surprising improvements in the work environment. Worker productivity and property value climb rapidly as a result. Interior secondary windows are the darling of the historic rehabilitation crowd. Design professionals and building owners with historically significant buildings are now free to carefully restore the windows without awkwardly butchering them with clumsy weatherstrips, heavy insulated glass or ugly exterior storm windows. Office buildings with single-glazed glass curtainwalls can be brought into the age of building science and energy efficiency with a well designed interior glazing solution that manages air infiltration, thermal conductivity, solar heat gain and acoustical performance in one swift economical swoop. 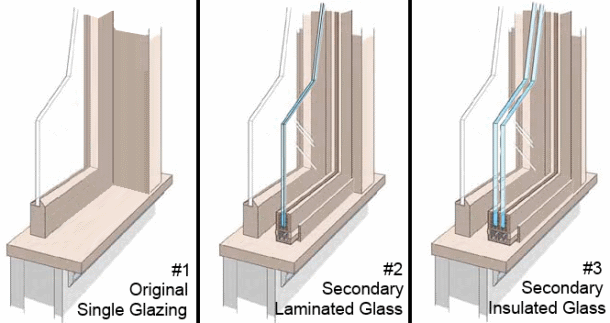 The interior glazing solution, far beyond what you might think of as an interior storm window, can be designed to blend perfectly with the existing curtainwall so that the interior aesthetics are preserved and even improved. A real beauty of the interior window is its ease of installation and lack of intrusiveness during installation. Interior windows can be installed in an hour or less with far less mess and disruption than a full window replacement. It is not uncommon that a worker might enter his office after the interior windows were installed, and not even notice that construction had just occurred. In addition to all of these benefits, when benchmarking time comes along, your property will rise to the top of the list of desirable, energy efficient properties, and your energy cost savings will be the gift that keeps on giving year after year. 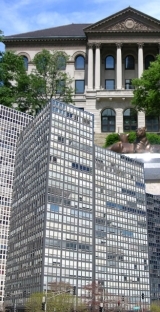 Let’s consider a 15 story, 100,000 sf office building in Chicago with 40% window to wall ratio. To this we will add a commercial interior storm window that is also glazed, and creates an air space of about 2 inches between the new and old glass. The report points out that these 25%-29% savings are for energy alone. Far greater savings can be realized when coupled with replacement heating and cooling equipment which can now be downsized due to the lower demand. By reducing peak electrical demand, there can also be a significant effect on the overall $/kwh pricing. The benefits keep on coming! Is there any reason to delay exploring this exciting new option? When benchmarking comes to your building, be ready! Need help planning for benchmarking with a window or curtainwall retrofit? to get a customized approach for successfully benchmarking your building with a window or curtainwall energy retrofit! Alabama, Arkansas, California, Florida, Georgia, Hawaii, Illinois, Indiana, Iowa, Maryland, Michigan, Minnesota, Nebraska, New Jersey, New York, Nova Scotia, Ohio, Oklahoma, Ontario, Pennsylvania, Texas, Wisconsin. Coming soon to your area. California, New York, New Jersey, Florida, Georgia, Hawaii. 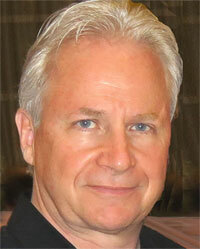 If you are in these areas and need help with your building, call right away and save costs. View inside the test chamber. The plywood end wall was constructed by the lab. One Day Glass on Safety Glass: Is It Really Safe? Gillian Babcock on Window Repair or Window Replacement?